USGI M14 birch stock, 50-90% fancy grain. You really do need to plan on refinishing these, as the dense USGI stain usually obscures the best of the tiger effect. I try to be conservative in my estimate of fancy grain percent. Stock may or may not have DAS and Circle P proofs. As New (Fred's "As New") - looks like a newly issued stock, with added handling marks. 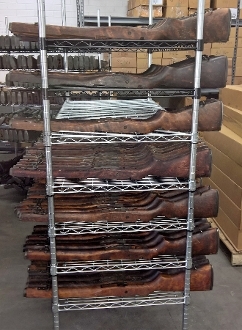 These were most likely off of newly manufactured rifles that were either shipped directly to storage or issued briefly before they were called in and eventually shipped to the de-mil arsenal. They went through the de-mil process, were tossed into shipping contaners and eventually sold to Fred's, stored for 20 more years, changed warehouses, then were shipped to TreelineM14. In other words, they may have been perfect in 1963, but they picked up some mileage in the meantime. Probably will have a couple of light dings and always some rubs in the finish. Metal is excellent, nearly perfect. Clean them up with mineral spirits, steam any of the small dings or scratches, and think about a coat of tung oil to renew the dried out finish. They should look pretty much new when you're done. They come with an Excellent Plus (looks new) original finish buttplate.